He! He! I'm just kidding guys! I'm not going to sue for chowling $upport! 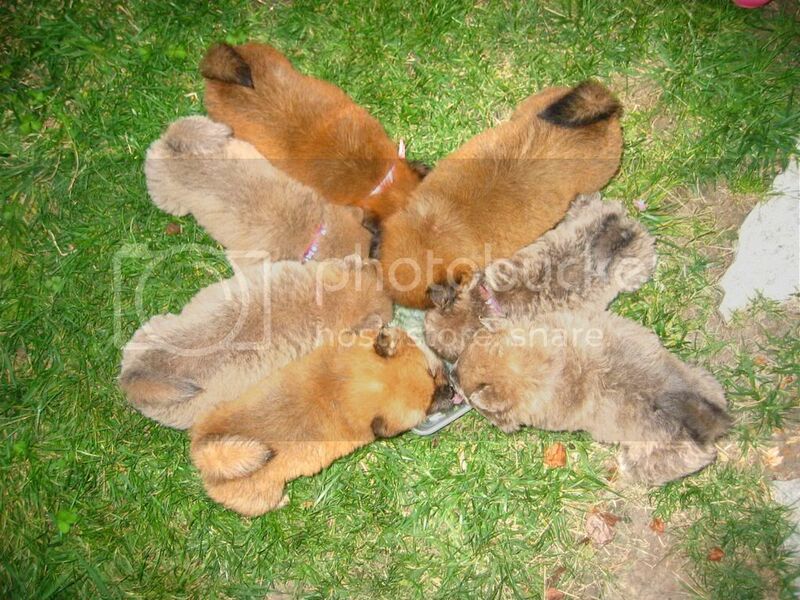 Auntie Jenn asked me to chowling sit for these 7 babies she rescued from a kill shelter in Los Angeles. I'm cheap (my chowling-sitting service rate, that is), so Auntie Jenn asked me to come on over to lend a paw (or two). And then Oberon stood on the nape of my neck. They're gonna need a lot of tender loving care so a nice foster mom who has taken care of lots of other puppies for Rocket Dog is taking all 7 of them for a couple more weeks so they get stronger. Although Cicero asked me if he can come home with me and started following me out. The chowlings are only 5-6 weeks old. That's me on the left. Six of them snoozed out on Auntie Jenn's floor and that's Desdemona who was always trying to get to my "you know" to snuckle. Last edited by Zhuyos mom on Sat Sep 29, 2007 7:04 pm, edited 2 times in total. Yes. They are orphans. Their mommy was killed. They were brought to the kill shelter in a box. I don't know the whole story but Auntie Jenn will find out tomorrow. She's really tired because she had to drive a long, long way to pick them up. That's why I gave her a very good *family* discount rate on my chowling-sitting services. I know they miss their mommy because they all kept trying to snuckle (snuggle + suckle) on my "you knows". Not sure what else to say, but oh my goodness...how absolutely cute. Poor babies, loosing their momma! I guess if you are going to be orphaned so small, they couldn't ask for better angels to care for them! Oh, Miss Pooh Bear! What a good Nanny and role model you are for those poor babies. You can't really blame them for sneaking a snuckle, you are like a furry, plush lined pacifier for those wee ones. Enjoy your time with them. Babies are so sweet. PS Any chance you could... um...keep one? So adorable. Miss PB, you are so kind to look after those babies. You are such a good chow-nanny! I think you could get your own television show as a chow-nanny! Well thank you for the compliments. The chowlings are now at their new foster parent's home. I don't think they'll need me to chow-sit since they are pros. But it was a lot of fun meeting the babies. I do think Cicero may come to stay with us for a little while. I'm not sure if it will be forever but I promised him that I would see him again. Seven chowlings dropped off at a high kill shelter in Los Angeles. Puppies from this particular shelter were known to not survive. There was not one rescue in Southern California that could accomodate all these babies. So the rescue network sent an urgent e-mail to all the California rescue organizations. Rocket Dog Rescue finally had a chow person on board. That's Jenn (zingara_princepessa). Once the president of Rocket Dog passed the information to Jenn. She sprung into action and these darling, innocent angels were saved. Needless to say, having taken 7 chowlings, the rescue could use a little pocket change. So Jenn and I thought of an idea. If anyone would like to sponsor a specific chowling, we will apply your donation to that chowling alone. We will give you updates on their care and when they are adopted into their forever families, we will provide you with a photograph. Costs for shots and spay/neutering and if any of these pups show a possibility of entropian, the rescue will need to provide these services full or partial. There is a runt in the litter. That one is Lazlo. The one PB spent alot of time with. We are hoping he will get stronger. If you would like to sponsor a specific chow or place a general donaton, please log on to http://www.rocketdogrescue.org And remember to note the donation is to go towards the Carson Puppy Fund and/or your specific chowling. Their names are posted on PB's photos. Tell me if this doesn't work. My secretary has decided to go on a break. Help now a days, I tell you! Miss PB, I thought you found them in the strawberry patch, which sometimes happens when you have been visited by Chowmen, according to Pip. I think an angel sent you those chowlings. I think you have already bonded with Little Laszlo...I hope he can worm his way into your mum's heart! We will try and sponsor one of the sweeties...for the price of a scooby snack a day, you could sponser a chowling...yeah, I like the sound of that! Why MissPB, Lou and Jenn, you have been busy!!!! You are all so wonderful (but then we knew that already ). The babies are darling. I was wondering Cicero would become a family member since he asked Miss PB if he could go with her! I'm glad he will at least stay for a while, he will love it there. Miss PB you are so super sweet to offer your chowling sitting services. Auddymay, I loved your post, strawberry patch and all! But the slogan has to be the best "for the price of a scooby snack..." Love it! I've got plenty of room being on a farm, but we are so far away, I would love to take a couple of them. any offers on the air fare to sunny South Africa. You make a beautiful mother, Miss Pooh Bear. I'm pretty sure I had nothing to do with those chowlings, considering my operation and all, but they do look a little like Steel in some of the pictures. Did he get his airplane fixed? I do make a cute chow mother! Unless immaculate-chowception occured, I know it can't be SteelO since I have never met him - besides, I had one of those type of ops too. But I was just having fun with you guys! He! He! Did I get your heart racing a little bit? Just a little bit? Auntie Carolyn, that is very sweet of you to say you would take the babies to South Africa. Can I send Mommy instead? Because I am pretty sure the babies will find nice homes here once they are bigger, stronger and healthier. Auntie Ciaobella, Oh thank goodness for all my fur! Had it not been for all my fur, they would have located my "you knows" and my eyes would have popped out of their sockets! Having 7 mouths snuckling my "you knows" - oh can you imagine?! Auntie Bama, you know, I was thinking about writing a spec and pitching it to the networks. What do you think about the working title "For a price of a scobby snack you get... CHOWNANNY!" I really like the tag line Aunties Auddymay and Chowfrnd created. But maybe I should reserve that for the Chowling fund? Yes, the Chowling Fund. Anyways, can everyone give Auntie Jenn some ?! Because Mommy and I had little to do with saving these babies. I know I am cute, but I don't want to take any credit away from these chowlings true angel who is Auntie Jenn. She has more good news to share, but that's for a different thread. Okay, that's it for now. I'm off to have a play date with baby Leonora at the resort she is staying. Last edited by Zhuyos mom on Tue Sep 04, 2007 11:06 am, edited 1 time in total. 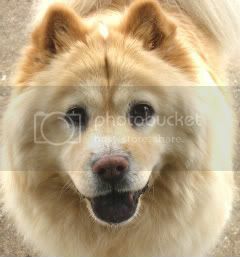 Miss Pooh Bear, the very thought of you thinking of me gets my heart racing like a dozen Chows on a zoomie run. I will chip in for sunny south africa, From a box in a high kill downtown shelter to a farm in sunny south africa what more could you ask for. Come on out here Mommy, life is great and you will be able to play with hte other Chows as well as the PIGS and chase them around the garden,if you feel like, but beware they can bite,The Parrots will learn to say your name, and then tell you to GO Outside, and then call you back for supper, they really talk to the chows all day, Roxie would help you feed them as she is now feeding two kittens that I rescued and has plenty of that white stuff left available for laa of your babies. I could never just throw one away. Yes, better to face the occasional puff adder than the mean streets of LA! Yeah! Big claps to Auntie Jenn for making the midnite run to Killtown to save those babies! Yeah, Auntie Jenn! That must have been a fun ride back with 7 little Chowlings in the car! Miss Pooh Bear - you are so lucky to Chowling-sit those little fluff balls! Have you whispered to Mom about who is your favorite? We'll have a talk with Mom about which snacks she should give up to help those Chowlings! I know they don't belong to Boogie and Teddie because they are terrified of Chow girls. They have been put in their place far too many times. The last one had Teddie hiding scared for his life. What a beautiful bunch of babies though!!!! It is wonderful that you were able to get them out and everyone is happy and healthy. There are far too many diseases in the shelter for all animals but expecially for the babies. That one lil' baby looks like it has curly hair They are Just ADORABLE!!!! Caro, with all due respect, there is no way I'm lettin' these monsters leave my immediate vicinity. It was a bit of work to get them, and I intend to adopt them to folks nearby so I can keep tabs on 'em!!! You are always welcome to come to CA for an audience, of course!! So...the details are very vague as to why these pups ended up in a high kill shelter in Carson, CA, and without their mom. I called there today and no one had any info, except to say that the puppies were brought in and labeled "stray" and "mother believed dead." The only paper work for them is from the shelter which says "too young to spay/neuter" but doesn't hazard a guess as to how old they actually are. A lovely woman named Cathy, who works all on her own, pulling dogs from several shelters in her area, contacted RDR. I got the email and of course when I saw their cutie little faces, I had to have them. So, Cathy worked out transport to a halfway point between SoCal & NorCal. I met a volunteer named Joyce, another great gal, at Harris Ranch, about 200 miles south of SF. She came north about the same distance. We met in the parking lot of Harris, and did the chow swap. I took them to my dad's to spend the night. When I let them out into the yard with Orso, they went piddle and poop on the lawn. It was incredible! It's like they knew how already! They were also really good inside. I put newspaper down in the kitchen and they used it. I am not making this up: they're maybe 4 to 5 weeks old and they knew what to do. Ladies and Gentlemen, I give you The Shakespearean Chow Chows! From top right: Desdemona, Oberon (the runty guy, but oh so sweet) and Cyrus.